9372 ft (2857 m) Highest point in the Aleutian Islands . Shishaldin is the real deal, the undisputed king of the Aleutian Islands and one of the most spectacular stratovolcanoes anywhere in the world. 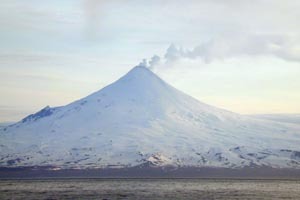 A near-perfect cone and a textbook example of the form, it rises over 9000 ft (2800 m) directly from the shore of the Pacific Ocean on the south side of Unimak Island, the easternmost and largest of the Aleutians. 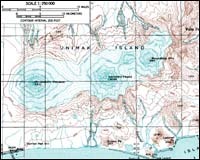 Shishaldin is located near the middle of this 65 mile (100 km) long island and is the youngest of the eastern group of Unimak volcanoes which includes neighboring Isanotski and Roundtop. Shishaldin is one of the most active volcanoes in the Aleutian Arc, with continuous steaming from its small summit crater and numerous recorded eruptions, which accounts for its youthful and symmetrical form. The entire cone above about 2500 ft (800 m) elevation is encased in permanent snow and glacial ice, and stunning ski descents are possible in any direction, although the south and east sides offer the most direct access (the summit is on the south edge of the crater rim). 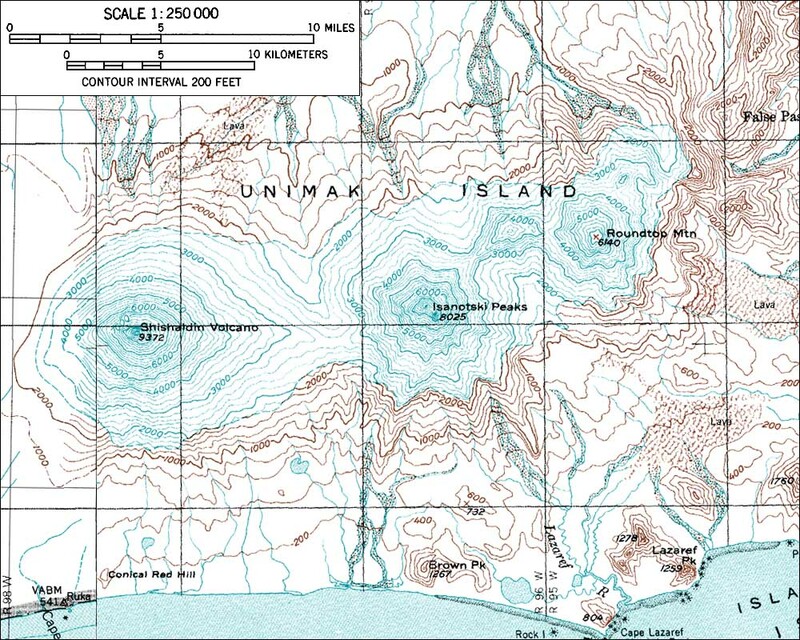 The best way to reach Unimak Island is to fly into the native village of False Pass, about 25 miles (40 km) east of Shishaldin, from Anchorage via Cold Bay on Pen Air.